CeBIT Hanover is the world-wide meeting spot for all companies and professionals in the computer and IT sectors. At CeBIT you get such a comprehensive, up-the-minute grasp of the market while experiencing the world’s foremost IT masterminds and engaging with solution providers and business associates. 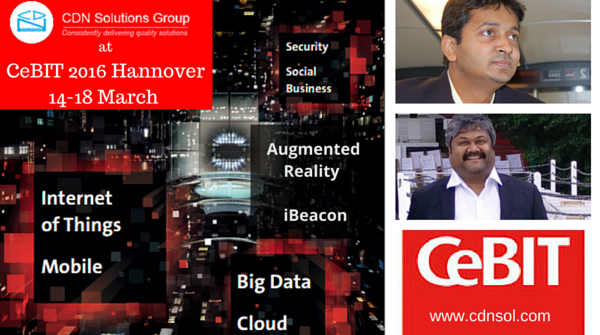 At CeBIT 2016, the major topics that will be in trend are Internet of Things, Big Data, Augmented Reality, iBeacon, Digital Transformation, Social Business, Cloud and Mobile Apps. Here we are sharing our personal experience to exhibit in CeBIT event. We (CDN Software Solutions Pvt Ltd ) have so many amazing reasons to exhibit at CeBIT 2016 Hannover and we are sharing the same with you. So here are 7 great reasons that encourage you to exhibit in the event like CeBIT. 1) More Bang for your Buck: – Exhibiting at CeBIT Hannover is one of the most cost effective way to reach qualified audiences. If you are also exhibiting at CeBIT 2016 Hannover event, you will feel awesome business experience there. 2) Less Work more Fulfilling: – Sales leads gathered at CeBIT Germany event require less effort to close. According to a survey, only 0.8 calls are needed to close a qualified trade show lead, compared to 3.7 calls to close a typical business sale. 3) Fresh Faces: – At events like CeBIT, every-time you exhibit there, you will always find fresh faces and new competitors that will encourage you to do amazing work and innovations. You get to know the market and trends prevailing in Germany. 4) Be a Part of Something Bigger: – More than a tradeshow, CeBIT Germany is where industry comes together to build network, learn new trends, and grow your business. Participate in vital discussions like our industry keynote and interactive town hall panels, update your knowledge through expert-led technical sessions and expand your reach via multiple networking opportunities. 5) Competitive Edge: – Tradeshows like CeBIT Hannover, offer your organization another opportunity to standout from the crowd. The event attendees use the opportunity to ‘comparison shop’. So this is your opening to figure out where your product is superior – in performance, pricing, service, etc. 6) Face Time: – You can reach more prospects in a five-day period of an event than your sales force can in three months. At CeBIT Hannover event, the meeting prospects and engaging face to face is also the fastest way to build relationships. 7) Close Sales: – Plain and simple, visitors have money to spend and you have products to move. Whether you close an existing deal or make a sale on-the-spot, it all happens at CeBIT Germany. So, CeBIT Hannover is the best place for business deals and sales. It is also a great place to acquire knowledge about latest IT trends like Digitalization, Internet of Things, Big Data and cloud, Social Business, Online Reputation Management, Augmented Reality, iBeacon, Enterprise Content Management, Smart Solutions, etc. We at CDN Software Solutions Pvt ltd finds CeBIT Germany, the most generic and knowledge gaining platform, that helps our organization to sustain in the market with respect of the business growth. This year, we are again exhibiting at CeBIT 2016 Hannover, You can contact us here to schedule an in person meeting during 14-18 March 2016.